We offer a wide variety of seed species for home and garden use, including wildflowers, grasses, legumes & shrubs. Our selection of wildflowers cover every climate zone and ecosystem in the United States and Canada. In addition to our pre-made regional wildflower mixes, our website offers a service not available anywhere else on the internet. You can create your own seed mix from “scratch” in our Custom Mixes section. This feature allows you to choose the flower colors, plant height and bloom-time that will meet your goals. See our Custom Mixes section to create your own wildflower mix. We carry a wide variety of popular grasses, forbs and shrubs for landscaping, terracing, and erosion control. 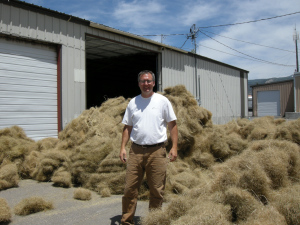 We carry a wide variety of lawn and turf mixes and single species. Our inventory meets a broad range of needs for professional landscapers, hydroseeders and homeowners. We carry seed and mixes for golf courses, sports fields, turf farms, home lawns, pasture and many other applications. Our pasture mixes are used in a wide variety of situations from ground cover to weed control. They work extremely well as pasture for Horses, Goats, Alpacas, Llamas or Cattle or for poultry and bird cover. Many customers use them to cover the “bald”spots in the yard or add depth to the fence lines. We can build you a mix for any situation and carry both irrigated and dryland mixes for all climates. We will custom mix to your specifications. We can add species or varieties to and mix on this website or build your mix from the “ground up”.